Last time, we featured the different destinations where one could go for a nice summer retreat in the Philippines. We featured Metro Manila haunts, Tagaytay attractions, and places of interest in Baguio City. This time, let me take you around the various wonders down south, in the Bicol region. Ah, Bicol. A land of fiery cuisine, gorgeous ladies, and stunning views, it is located at the southernmost part of Luzon, and it has some of the most unpredictable weather in the country. The morning could start out being bright and sunny, then dark rain clouds will soak the whole region with unexpected rain showers. This is also a place that experiences the full power of the monsoon season, but the people living here are so used to it, they simply shrug it off, secure all the loose furniture and knickknacks, and ride it out until it’s over. Best time to come here is definitely during the dry season, which is from March to mid May. Because of its geographic characteristics, Bicol can offer the best nature experience. One can enjoy white sand beaches, explore mysterious caves, hike through mountains and volcanoes, and visit cultural sites. In the past 10 years, there have been many developments that enhanced Bicol’s true potential to become what it is today—a prime tourist destination for people who want an ultimate vacation experience. There are two ways to get here from Manila, so take your pick: you could be on a plane for a 45-minute flight, or if you want the full road trip experience, you can make the 10-hour drive with your family or friends. By plane, you’ll be landing at the Pili Airport, which is a 20-minute drive away from Naga City. If you’re going by land, you’ll be making your way past Laguna, Quezon Province, Daet, Camarines Sur, then Naga City. Once you’re in Naga, you can start by going to Panicuason and Malabsay Falls. Nearby is the Panicuason Hot Springs where you can soak in hot, bubbling water. There’s a new attraction there called the Tyrolean Traverse and Trustfall, where you have to cross a rope between two towers that’s about 20 feet high, then once you reach the middle you let go and fall backwards onto a net below. It’s the same adrenaline rush as bungee jumping, and it’s perfect for thrill seekers. It’s only natural to feel famished after a day of adventure, so head on over to Naga City to eat the famous kinalas, a noodle dish that is comforting yet affordable, and possibly one of the best things that you can have on a rainy day. If slurping hot soup is not your thing, head on over to the Geewan restaurant for authentic Bicolano fare. Try the spicy Bicol express, which is chopped pork in a broth of coconut milk laced with chilies, kinunot and gulay na natong. You could also go to Magsaysay Avenue, as it’s a whole stretch of different restaurants on either side of this famous road. After chowing down on all these scrumptious delights, you’ll be energized and ready to burn off the calories. Go to the Camarines Sur Watersports Complex for a whole day of fun. Situated right in the Provincial Capitol Complex, there are plenty of things that one can do here. There’s wakeboarding at the man-made lake, swimming, bopping around on the massive inflatable structures on the water, and so much more. They also serve wonderful food, so don’t miss out on the laing pizza once you’re there. The next day, take a trip to the Caramoan group of islands and do some island hopping. The lagoons, pristine beaches, white sands and peaceful vibe of Caramoan are perfect for some much needed relaxation. The beaches have not been taken over by enterprising individuals yet, so you won’t find a single smoothie stand or anything like that. Here, you get to go camping, cook your own food, and return to a simpler time, much like what the contestants of Survivor Caramoan did here two years ago. For a spiritual retreat, climb the 524 steps leading up to the Shrine of Our Lady of the Most Holy Rosary. The 26-foot image is lit up at night and acts like a lighthouse to guide fishermen back to the shore. 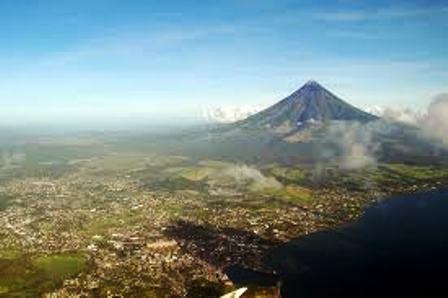 Take a trip to Albay to get a glimpse of the famous Mayon Volcano. You can go trekking on the volcano and have a stunning view of the Pacific Ocean and the different towns, lakes, villages, fields and other mountains. Visit the Cagsawa ruins, which is a lone bell tower that remains of the old Cagsawa town. 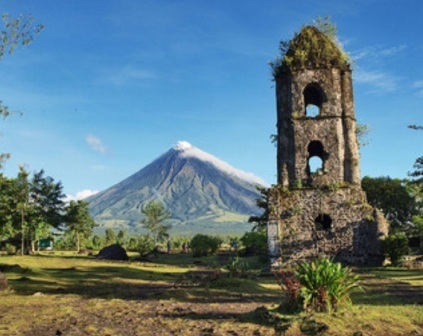 When Mayon erupted in 1814, the whole town was engulfed in fiery lava, and the people fled to the church but were unable to survive the lava flows. Only the bell tower remains as a reminder of the town’s tragic past. A lot of people go to the ruins, and though it can be quite rife with tourists, it is very picturesque and worth the trip. There are stalls selling chili shakes and chili halo halo, which is a must-try, as you can’t get this anywhere else in the Philippines. 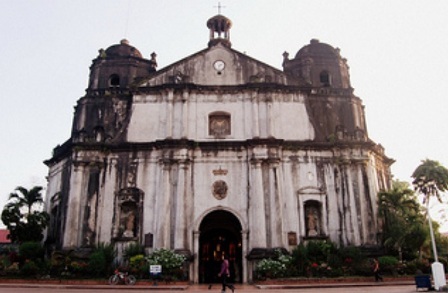 Stop by the Daraga Church, a national cultural treasure with walls made from hardened volcanic rock and from where you can get a scenic view of Mayon Volcano. On another day, you can drive over to Sorsogon, dubbed the Switzerland of the Orient, where you can visit the Philippine Bee Farm, Sorsogon Dairy Farm, Rizal Beach, Lake Bulusan, Mateo Church and the Mateo Hot Spring. Perhaps one of the best things to do in Sorsogon is swimming with the whale sharks. You can interact with the biggest fish in the world in the tranquil fishing village of Donsol. Swimming with the butanding is a unique experience that can be had in very few places in the world. For a romantic time, do some firefly watching at the Donsol River. It’s breathtaking, seeing the mangroves completely lit up by thousands of flickering fireflies. You can explore the pink sandy beaches (yes, you read that right, pink beaches) of Tikling and Calintaan island, and go snorkeling or explore underwater caves. If you need some time to relax after all your adventures, take a dip in the hot and cold springs of Irosin, known as the wellness capital of Bicol. Being here gives you all the benefits of being at a 5-star spa, without the high price. Then indulge in some Sorsogon delicacies like crabs cooked in coconut milk, mussel soup and seaweed salad. A summer holiday in Bicol is an adventure for the young and the old alike, for singles on a solitary journey or for couples who want to have a romantic time together, and for foodies looking to indulge their taste buds. There are several places outside of Naga, Albay, Caramoan and Sorsogon that are worth checking out too, such as the Buhi Lake, where one can find the smallest fish in the world, sinarapan, and where you can try the best home-cooked Bicolano cuisine. There’s also Daet, Camarines Sur, where you can surf or take a refreshing boat ride. And of course, there’s Masbate, home of the Rodeo Masbateno, where cowboys and cowgirls compete in riding horses, lassoing cows, and the like. With so much to see and do in Bicol, it will definitely take you more than three days to visit all the best places here, so plan on staying at least a week to get the most out of your summer in this region. Next week, we close this series with our final summer destinations, Cebu and Boracay!